I was so excited about this project that I forgot to take pictures of a few steps...but I can still give you a good idea of how to pull this off. 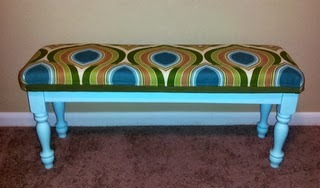 Begin by painting the legs of your bench and any other part of the bench that will be seen. 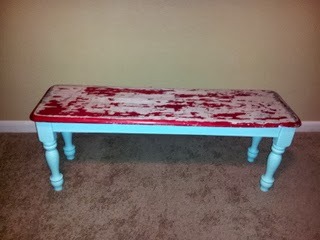 This is my old weathered red bench after I painted the legs. 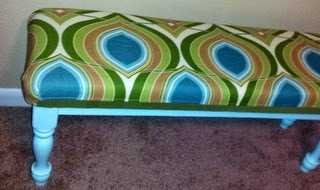 The bench was 14" by 47", I bought a piece of green foam at Joann Fabrics that was 20" by 48". I cut it down to 13" by 45" (use a bread knife). 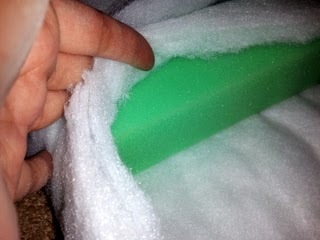 I then laid out a long piece of quilt batting, laid the green foam across the top and began to wrap the batting around the foam by slowly rolling and smoothing. Make sure that there is some extra batting hanging of the edges on both sides to fold up on the next step. Once the batting seemed even and smooth, I used safety pins to keep it in place while I basted it down to itself to keep it from shifting while working with it or sitting on it. You will need to trim a few of the layers on the short edges to get the batting to fold up smoothly, then baste. I made a dumb mistake when I purchased my fabric for the project. I bought enough to cover the top of the bench and the sides of the foam, but not enough to wrap to the underside of the bench itself. When calculating your fabric take the length and width, then add the depth of the foam (mine was 2"), then add another 2-3 inches per side. 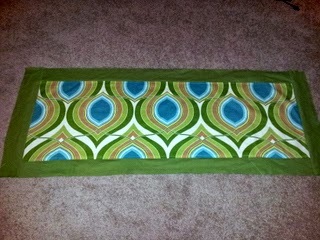 My bench was 13" by 47" so my fabric should have been at least 23" by 57", it wasn't. I has to add extra fabric around the entire edge to make up for the problem. The end product turned out okay, but I wished I had just done it right the first time. 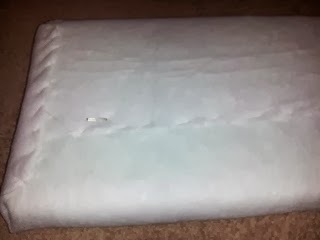 Turn the fabric right side down, put the wrapped foam on top and center it, then put the bench upside down on top of the foam. I turned my fabric under on the edges as I go, because I don't like raw edges, but it's not necessary, as no one will likely ever see it. 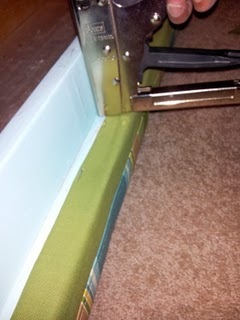 Using a powerful staple gun, staple at 4"-6" intervals. It is good if the staples don't go all the way in, as you may need to make adjustments, and it is much easier to remove them if they aren't completely embedded. The corners will be tricky, you will have to tuck and pleat and just mess around with it till it works. The best way for me to explain it is imagine you are wrapping a present and tucking the edges into a triangle-ish shape to fold up the sides. Turn the bench right side up to see if any adjustments need to be made. Then turn upside down and fix any issues, then staple about every 2 inches, tap down any staples that are sticking out. Ta-da! I don't love the green stripe of color, but I didn't have much choice. All in all I am happy with the finished product.